The St. Louis - San Francisco Railway bought a total of thirty 4-8-2s from the Baldwin Locomotive Works to be used in passenger service. Fifteen (road numbers 1500 through 1514) were delivered in 1923, five (road numbers 1515 through 1519) came in 1925 and the final ten (road numbers 1520 through 1529) arrived in 1926. All thirty of these "Mountains" had 28 x 28 cylinders, 69" drivers, a 210 psi boiler pressure, a tractive effort of 56,800 lbs and total locomotive weight as shown in the chart below. 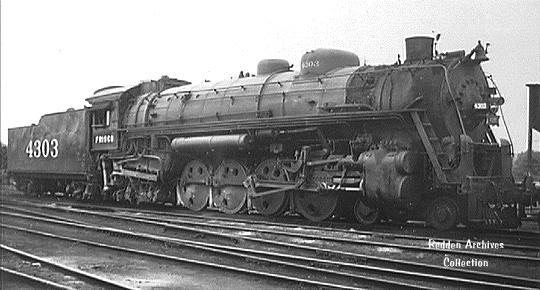 During the late 1930s, the SLSF needed new locomotives, and money was tight, so the West Springfield Shops undertook a project to build a total of 34 4-8-2s from older locomotives. The first eleven of these rebuilds, outshopped in 1936 and 1937, were built from used 2-10-2 parts and were assigned road numbers 4300 through 4310. They had 27 x 30 cylinder, 70" drivers, a boiler pressure of 250 psi, a tractive effort of 66,400 lbs and weighed 431,110 pounds. Another 23 4-8-2s were built using the boilers from 2-10-2s between 1939 and 1942. These locomotives were assigned road numbers 4400 through 4422 and had 29 x 32 cylinders, 70" drivers, a boiler pressure of 210 psi, a tractive effort of 68,600 lbs and weighed a whopping 449,760 pounds. They were the heaviest Mountains ever built. Locomotives numbers 4400 through 4412 were built as oil burners and numbers 4413 through 4422 burned coal. There are six surviving SLSF "Mountains". Number 1522 was donated to the Museum of Transportation in the early 1950s. It was restored to operating condition by a volunteer group known as the St. Louis Steam Train Association and has run several excursions. Today, it is undergoing a major overhaul and is scheduled to run again in May of 1999. Data from 1947 and 1951 St L-SF locomotive diagram books supplied in May 2005 from the extensive collection of Allen Stanley. Jim Quarles in a 1996 article entitled "Those Magnificent, Distinctive, Homebuilt, Frisco Mountains" (published on the web at , accessed 7 July 2007) says that this set of 11 engines was used to test the idea of rebuilding the never-satisfactory 2-10-2s into dual-service Mountains. (The more definitive conversions of 1939 -- the 4400 class -- are discussed in Locobase 224). 4300s used a cast frame and rode on Scullin disk drivers. Thermic syphons enriched the firebox heating surface in both the firebox itself and the combustion chamber. 14" (356 mm) piston valves admitted the steam to the cylinders. According to Quarles, "They did have problems with the boilers cracking, because of a deficiency of the type of material specified for use in the boilers." He adds in the shops' defense: "Remember much of the advancements in metallurgy and technology during this period was being done by the railroads. The stresses and strains a boiler goes through are not trivial." The Frisco nevertheless secured 15 years of useful work before dieselization rendered them redundant. The class was "dismissed from service" between 23 April 1952 and 20 October 1952. Frisco rebuilds reusing all parts of earlier 2-10-2s (Locobase 8537) above the running gear. Oil-burners 4400-4412 pulled both freight and passenger trains; 4413-4422 burned coal and pulled freights only. Jim Quarles in a 1996 article entitled "Those Magnificent, Distinctive, Homebuilt, Frisco Mountains" (published on the web at , accessed 7 July 2007) argues that about all that was left of the 2-10-2 in the conversion was the original builder's plate. The increases in heating surface and larger piston valves, together with the greater cylinder volume, made for more power at speed than the first set of conversions (see Locobase 8653 for the 4300s.) Chris Hohl found that the last twelve were delivered as coal burners. According to the Frisco diagrams, they were fitted with Standard BK stokers, brick arch in the firebox, and trailing tenders with coal pushers carrying 20 tons (18.2 metric tons). The St Louis-San Francisco's 1947 locomotive diagram book shows that the firebox had two Nicholson thermic syphons of 76.2 sq ft (7.08 sq m) in area; 4410-4411 had an additional syphon in the combustion chamber. Piston valves measured 15" (381 mm) in diameter. It also shows that 4407 & 4409 weighed considerably less on the drivers (278,850 lb/126,484 kg). Although the Frisco Diagrams show Elesco superheaters, most of the class used the Coffin setup (Frisco notes show that only 4400-4404, 4407, 4409 used the Elesco.). 4405-4409 had less superheating surface, their boilers holding only 54 flues but 245 tubes. Data from table and diagram in 1930 Locomotive Cyclopedia and SL&SF 1930 Locomotive Diagrams supplied in May 2005 by Allen Stanley from his extensive Rail Data Exchange and DeGolyer, Vol 74, pp. 335+. Works numbers were 56137 in January 1923; 56265-56278 in March; 58606-58610 in August 1925. Firebox fitted with combustion chamber and thermic syphons. The boiler and firebox were very similar in size to that of Frisco 2-8-2s delivered by Baldwin in the same period. 1500-1514 burned oil fuel and used Baker valve gear. Steam was admitted through 14" (356 mm) piston valves. The combustion chamber contributed 95 sq ft (8.8 sq m) to direct heating surface. Problems with the Baker gear (which were later cleared up, according to Don Wirth in January 1989 Railfan), led the Frisco to order the next five with Walschaerts gear in 1925 followed by the last ten, also with Walschaerts gear, 1926. "Throughout their careers,"says Wirth, "...the 1500s were well liked by engine crews, dispatchers, and the motive power department. They were a true general-purpose locomotive, as well suited for use in hotshot freight service, fast passenger service, or even on the local." Some of their passenger runs were impressively long and included St Louis to Oklahoma City (542 miles/873 km) and Kansas City to Birmingham (737 miles/1,187 km) without engine change. The last ten were completed to a different boiler and firebox design; see Locobase 15333. Data from DeGolyer, Volume 74, pp. 373+. See also SL&SF 1930 and 1947 Locomotive Diagrams supplied in May 2005 by Allen Stanley from his extensive Rail Data Exchange. (Thanks to Chris Hohl for his 18 August 2017 email noting some final-configuration details in the 1522, which last operated in exhibition service in 2002. His 6 March 2018 email supplied the link to  to confirm that only the trucks had roller bearings.) Works numbers were 59132-59134, 59169 in April 1926; 59198-59203 in May. Locobase 223 describes the first twenty Baldwin Mountains that were delivered to the Frisco in 1923. The 1926 batch featured quite a few changes in the firebox and boilers. The firebox was fitted with combustion chamber and thermic syphons; the former contributed 89 sq ft (8.25 sq m) and the latter 84 sq ft (7.8 sq m). And the balance of tubes and flues shifted in favor of more large-diameter flues and, in this case at least, more superheater area. Fourteen-inch (356 mm) piston valves delivered steam to the cylinders. Although these ten were delivered with Sellers injectors and were coal burners, but were shortly converted to oil firing with Chicago injectors. Their 1930 tenders held 4,500 US gallons (17,033 litres) of oil that weighed 233,120 lb (105,742 kg). The Frisco diagrams from 1947 show a superheating surface of 1,222 sq ft (113.5 sq m). Hohl notes that 1522, like the others in its class, set its boiler at 210 psi. Her drivers turned in friction bearings and measured 69 1/2" (1,765 mm). She used a trailing truck booster that generated 8,750 lb (3,970 kg). In either version, the 1500s were highly regarded by their crews and served the Frisco throughout the steam era.